In his statement, the British delegate did not mention the issue of foreign judges but called for a “credible” transitional justice mechanism among other things. 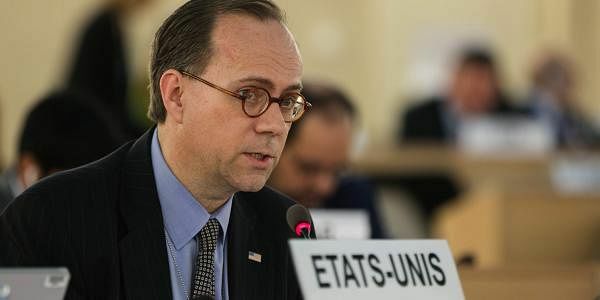 COLOMBO: At the on-going session of the UN Human Rights Council (UNHRC) at Geneva on Wednesday, the US expressed concern over the Sri Lankan government’s statements against having foreign judges in the judicial mechanism it is to set up to try war crimes cases. But the UK laid stress on the importance of devolving power to the Tamils to bring about post-war reconciliation. While noting progress in democratization and restoration of checks and balances in the constitution, the UK delegate said that still much remains to be done. He commended the work of the Consultation Task Force on Reconciliation Mechanisms but asked the Sri Lankan government to give due consideration to its recommendations. He urged the government of Sri Lanka to provide the “determined leadership required to deliver fully on the commitments it made when co-sponsoring resolution 30/01 and to develop a comprehensive and time bound implementation strategy.” “In particular, we (the UK) would encourage the Government to deliver meaningful devolution through constitutional reform, establish credible transitional justice mechanisms, return all remaining military-held private land and replace the Prevention of Terrorism Act with human rights compliant legislation,” the UK delegate said.